Lee’s true talent as a writer shines through every page as he takes Daniel and the reader into the mother of all head trips… I can’t wait for the next novella in the series. I may just hop on a plane and head to England so I can knock on Frazer’s door and demand an advance copy. Trust me, you’ll feel the same way, too. It may cost you your soul. Daniel Gates is a fixer. Whatever his client wants, he can get – for a price. But the price of his latest assignment is a high one indeed. He is to travel to Scotland to exchange a rare demonic text, a grimoire, for a consignment of even rarer whiskey. Reading the grimoire, Gates learns of the legend of Lucifer’s Glass and the unholy trinity of green-eyed demons who protect it. As he does battle with the demons, Daniel realizes too late that there is much more to his assignment than meets the eye. He is locked in a struggle to save his very soul from damnation. The door was open and Daniel entered, calling out to the old man. Even if the old fellow was not open to negotiations, it was in Daniel’s best interest to try and get him on-side. He had no idea if the boat was coming back for him and so might have to stay the night on the godforsaken island. Daniel walked into the room housing the well. He heard the same sloshing sound coming from within and crossed the room to investigate. Another slosh—louder this time. He gripped the side of the well and peered into its still, dark waters. There was no sign of movement. Then, with a heart stopping splash, hands erupted from the water, grabbing and clawing at his face. Daniel fell back in shock, and liquid splashed over the sides as his assailant thrashed around helplessly. The man must be drowning in there. Daniel got to his feet and rushed to help. The man inside the well was indeed drowning, his head beneath the water so that Daniel could not make out his face. He was trying desperately to gain purchase on the slick rocks with his free hand, but each time he tried, the farther he seemed to slip under those deep, black waters. Daniel thrust both his hands into the well, but the man inside had stopped trying. Daniel’s fingers skated across the cold wet surface of the man’s hands. Then, the drowning man dropped suddenly, as though some great monstrous unseen thing had latched on to him and pulled him down beneath the surface. Dark water spattered Daniel’s face and mouth and he fell back. He spat the moisture from his lips, but he had already swallowed some of the fluid. The taste was unmistakable. His senses went haywire at the taste, earthy and woody and finer than anything that had graced his lips before. He had no doubt the well was filled with the stuff, a deep mother lode of The Zero Malt. A tiny voice had already started chattering within his skull, to lean over the side of the well and drink his fill. To scoop great handfuls of the dark juice into his mouth, to climb in and swim in the stuff, allowing it to permeate every pore in his body. Shaking the voice from his head, he looked down at his reflection in the well. He had no desire to go the same way the stranger had. However intoxicating the liquor, he had to put some distance between himself and the well—between his soul and temptation. Scrambling to his feet, he ran toward a ramshackle door at the back of the room. Slamming the door behind him, he found himself in another dingy room. Buzzing flies murmured from the shadows. As his eyes adjusted to the scant light coming through the crack in a single boarded-up window, Daniel saw he was in a tiny galley kitchen. The place was in disarray—a large table lay upturned on its side on the other side of the room and broken crockery littered the floor. Cobwebs hung from the rusted hob of a filthy old stove. He set about looking for a vessel to fill with the whiskey from the well. If he returned with a sample of the precious liquor, he might yet be able to quadruple his fee. The cupboards nearest him were bare. Any jugs or bottles in the kitchen lay broken on the floor. He crossed to a dresser behind the overturned table and gasped at the fresh hell laid out before him. The floor on the other side of the table was awash with blood and entrails. A ruined corpse lay at his feet, flesh and clothing torn open as though it had been eviscerated by some feral beast. Its face had been eaten away; little flaps of skin and beard the only discernable features left. These and the man’s clothes were the only clues left to the identity of the victim—the old distiller. Gagging on whiskey-tainted bile as it bubbled up into his throat, Daniel stepped across the corpse towards another door. Loose teeth crunched horribly beneath his footfalls. He bit down hard on his lip to stop himself from vomiting. As if in a dream, he found himself walking back to the corpse, even as every rational nerve impulse in his brain begged him to turn around and head the other way—to run from that horrible scene and never look back. Further still, he found himself crouching next to the ruptured chest of the corpse. He watched, almost outside of himself as a hand thrust out of the raw meat cavity of the dead man’s chest. The hand was clutching a blood-stained book. 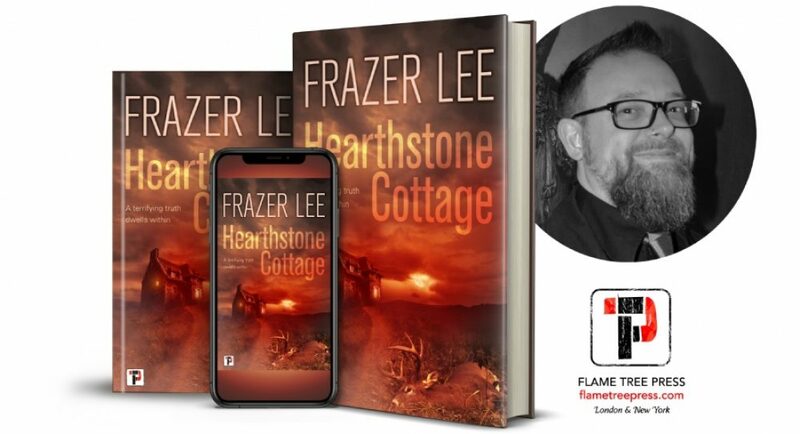 Pingback: Accomplished Screenwriter, Director, and Author Frazer Lee Discusses His Newest Novella, Writing, and His Pesky Eating Habits | Oh, for the HOOK of a BOOK!